Royal Irish Yacht Club one design skipper Nigel Biggs was sailing his C&C 30 Checkmate at the North American Championships araced as part of NYYC Race Week at Newport. The crew finished sixth out of nine. Results are here. Today sees the start off the Wicklow Pierheads of largest and most varied fleet in the 36-year history of the biennial Round Ireland Race from, which in its 19th edition takes on board sponsors Volvo Car Ireland for the first time. The fleet ranges in size from a trio of boats around the 31ft to 32ft band, right up to the 88ft–Rambler, with the three exceptional trimarans of the MOD 70 class next in size. But while attention will inevitably focus on the super-machines at the top end of the fleet, many of those taking part are club sailors from Ireland and overseas, racing standard craft which have only been modified where necessary to comply with the strict R0RC regulations which a race of this calibre requires. As well, the re-birth of local offshore racing in Irish waters is well-reflected with the presence of boats which have been giving a very good showing of themselves in weekend passage races, while boats which performed well in both last year’s Dun Laoghaire to Dingle Race in June and the Rolex Fastnet Race 2015 in August are also very much in contention. W M Nixon gives his take on the mood of the moment, and shares a few pointers for possible top performers. With most of the top boats assembling as pre-arranged within the ambit of the Royal Irish Yacht Club through this past week, they’ll have shared with the Irish people an almost freakish drop in the temperature as the low pressure area over England, which was in turn sending even worse weather into France for the European Football Cup, began to bring to us here in the Emerald Isle a wet and windy northerly airstream of quite remarkable coldness. Thursday June 16th – Bloomsday by happy accident – was selected for the evening in which we all could get to know the legends of sailing at an evening reception at the Royal Irish. When the date was being set, you can so easily imagine the organisers visualising a balmy summer evening, with the scene augmented by the DBSC fleet returning to port from their regular Thursday fixture, while on the waterfront terrace of the elegant old yacht club, people could stroll in their summer finery – perhaps we’d even have a Bloomsday veteran or two still properly garbed – and it would be just such a perfect June evening. But things happened otherwise. Within the already cold northerly airstream, through Thursday a small but always measurable balloon of hyper-cold air between 9 and 11 degrees appeared at the north end of Ireland’s east coast. It spent the day moving southward, remaining remarkably intact in size, and by party time on Thursday at the RIYC it was sitting plumb over Dun Laoghaire, with the temperature at its cold heart now persistently down at 9 degrees. But anyone who reckons that such a situation would be the ultimate party pooper just doesn’t get it with the kind of people who do the round Ireland, and particularly those who come a long way to take part. They had themselves a ball, they had themselves a blast, and there more were twists and turns to the potential of the Dun Laoghaire-Dublin setup that even the locals would now of. For instance Brian Thompson, sailing master of Lloyd Thornburg’s all-conquering MOD 70 Phaedo 3, is up to speed on matters Irish, having been a crew-member when Steve Fossett’s 60ft trimaran Lakota established the Ireland circuit record of 1993 which stood for 22 years. So on Thursday night when he heard it was Bloomsday and that that Joyce’s Portrait of the Artist As A Young Man was on at the Pavilion Theatre just across the road, he showed his face for just long enough to be polite at the party in the yacht club, and then skedaddled across the road for a night of high culture. Meanwhile, RORC Commodore and longtime RIYC member Michael Boyd was settling in very well in the midst of this throng in his home club, working the room and savouring the moment, for nearby on the pontoon was the First 44.7 Lisa which he’ll be skippering round Ireland. He already won the race in 1996 with the J/35 Big Ears, but for the 2016 race he definitely has the more comfortable boat with all mod cons. So when it was mentioned that the start of the race at Wicklow is exquisitely timed to exactly match the kick-off in the European Cup’s Ireland-Belgium match in Bordeaux, it didn’t take a feather out of the Commodore, as he cheerfully accepting that the first two hours of the race would be a little slow for Lisa “because only the helmsman will be on deck, the rest of us will be below watching the match”. His brother Paddy, home from Canada and almost straight into the Round Ireland, will be sailing with Michael together with a formidable crew which incudes the likes of Barry Hurley and Tim Greenwood, so with Lisa well in the frame in the RORC points table, we can be sure that the points weighting of 1.4 which the Round Ireland provides will be treated with the seriousness it deserves. Nevertheless the idea of watching football matches on a yacht in mid-race just wouldn’t go away, and Paddy recalled the race of 1994 which he did with Mark Mansfield as skipper aboard Brian Buchanan’s Frers 49 Hesperia (overall winner in 1988 with Dickie Gomes as skipper), the boat having become AIB for the duration of the race. As it happened, that duration wasn’t very long. On the Saturday night they were pacing nicely with Moonduster with the Tuskar astern, both boats turning pleasantly to windward in classic Frers style in abut 15 knots of wind, and all well with the world with the watch off duty (and some of the watch on duty) glued to a little screen in the saloon, where Ireland could be seen playing Italy in the World Cup in the US. Ireland scored a goal…... From the depths of AIB/Hesperia’s saloon, there erupted a mighty road of approval. And the mast fell down. Just like that. For no clear reason. This has led Paddy to develop a theory that just as an opera singer can shatter a wine glass with a particularly note, so the wild shout of Irish approval for a goal score can bring down a perfectly-tuned mast. When you’re getting theories like that being learnedly discussed, you get the gist of the party, but there was much more to it than that. Every so often a blast of cold air would erupt into the clubhouse as some new international crew from some boat of legend swept into the party, and I have to tell you that top modern sailors are getting very tall. Not beanpole tall, either. Just big strong tall – maybe they have special breeding programmes to improve the line in France and the US, which is where most of them seem to have originated. Thus it says much about the size and presence of George David of Rambler 88 that he still stood out in the midst of this crowd of sailing giants in the rather august setting of the RIYC’s stately rooms. He is some piece of work. It’s unlikely he’ll ever apply for the free bus pass for which he qualified a year or two ago, but if Wall Street was ever blown away, he could turn a bob or two as a stand-up comedian. Another option would be a writing a book abut his personal fitness regime, if he has one, for although he’s a big fellow he moves with the grace and ease of someone half his age. And while he’s at that stage in life when most us look at the world through a network of veins, his eyes are as clear as an Optrex ad. As to the business of Rambler 88 breaking the Leopard (Mike Slade) Round Ireland course record of 65 hours from 2008, George David reckons it’s very much on the cards. 2008 was a messy race, with more wind than was useful, and Leopard’s average was only 10.8 knots. But for 2016, Rambler’s skipper figures that if they can make a reasonably efficient job of the uphill sailing to get to the Fastnet, they’ll be looking to average 25 knots along the western seaboard and north coast in strong sou’west to west breezes, and there’s even a chance than once they get near the Irish Sea, the wind will have veered a little more to give them a slant down to Wicklow. “In most of our races, we expect an average of 13 to 15 knots, and though this can be a difficult course, it’s looking quite good at the moment”. With the Rambler 88 crew including sailors of the calibre of America’s Cup winning skipper Brad Butterworth and Andrew Cape on board, it is indeed looking good. While Rambler is odds-on to be the first mono-hull to finish, it’s highly likely the oldest boat in the race, the beautifully-restored 43ft Tyrrell ketch of 1937 vintage, Darryl Hughes’ Maybird, will finish last on the water. He found himself in Dun Laoghaire marina berthed just ahead of Sidney Gavignet’s MOD 70 Musandam-Oman, and in the whirl of people up in the clubhouse, the Number One aboard Musandam, Derrynane’s favorite sailor Damian Foxall was relaxed in one of those constantly changing groups which at one stage included Darryl Hughes and northern sailing journalist Betty Armstrong, who is one of the few sailing journalists who has ever actually helmed a MOD 70. Maybird looking tiny amongst assorted exotica in Dun Laoghaire Marina on Thursday evening. Yet once upon a time in the late 1940s, her sister-ship Aideen (below right) was one of the biggest yachts about the place. Normally journos are padded up with safety gear like a sack of potatoes on the Mod 70s, for as we learned when one of them capsized in Dublin Bay in 2012, they’re so wide it’s dangerous to fall off them (the MOD 70s, that is…). But out in Valencia, when Betty was the journalist on board Musandam Oman for an inshore race, and she’d found herself a safe spot on the forward netting. Bur there was a straightforward sail back to the harbour, and Damian made his way forward and asked her back to the cockpit, and when she was there, he asked her would she like to helm: “There’s nothing to it”, said he. 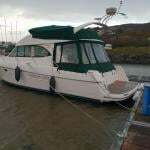 So there was Mrs Armstrong of Bangor in County Down helming this wonderful machine at a very smooth 25–knots, and as she says: “Do you know what, there really was nothing to it. 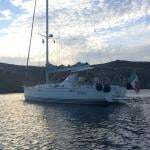 The boat was going so smoothly and there was so little feel in the helm that it was only the speedometer which could persuade me I was steering a sailing boat at 25 knots”. Very soon, however, the weather will be dominated by a big wet low out in the Atlantic, though some comfort can be taken from the fact that pressure won’t become excessively low over Ireland. But the isobars will be close enough together to provide freshening breezes, and well before midnight tonight, the sou’westers will be established at the Tuskar, becoming strong during tomorrow all along the South and West coasts. Thus getting to the turn in the Fastnet Rock/Mizen Head area is crucial (as it always is), but this year it’s especially the case. And of course while the MOD 70s and Rambler will be looking to have it ticked off well before noon tomorrow, anything much smaller will inevitably be facing a slugging match all the way from somehere north of the Tuskar Rock right down to Ireland’s great southwest capes. KATSOU (Alan Hannon, RORC & RUYC) This Reichel-Pugh 45 attracted much favourable interested in one of the premier berths at the RIYC on Thursday night, and rightly so. She comes with a good track record, and for this race she has a formidable crew built around the very best of the northwest from Lough Swilly YC, with Richie Fearon navigating (he navigated the winner Tanit in 2014) the winning Clipper Race Skipper Sean McCarter (he also was awarded the Cruising Club of America Rod Stephens Trophy for seamanship last year after successfully dealing with a man overboard in the North Pacific), and also Diarmaid MacAuley, one of the north’s best offshore helms. LISA (Michael Boyd, RORC & RYC). RORC Commodore Boyd has form in the round Ireland, he won in 1986, and Lisa certainly has form this year in beingin the frame in the RORC Championship. A First 44.7, she should cope well with the expected conditions. EURO CAR PARKS (Dave Cullen, HYC). Also known as the Kelly family’s J/109 Storm, she has been chartered for this race by World Half Ton Classics Champion Dave Cullen and he has assembled a crew of six champions (himself included) from last weekends ICRA Nats. When you’ve the likes of Mark Mansfield, Maurice “Prof” O’Connell and Johnny Murphy sharing boat space, then good results are expected. MOJITO (Peter Dunlop & Vicky Cox, Pwllheli SC) They’d a good second in last year’s Dun Laoghaire to Dingle Race, they’re one of the most consistent J/109s around, and they draw their crew from both sides of the Irish Sea in the best traditions of ISORA. TEASING MACHINE (Eric de Turckheim, France). One of the world’s most sporting offshore racers, this 13m Archambault hs a go at everything from the Commodore’s Cup to the Sydney-Hobart, with a Fastnet thrown in for good measure. She’s always in the frame, she’s an amazing boat, and she and her crew will give of their best. DESPERADO OF COWES (Richard Loftus, RYS) This vintage Swan 65 would be a good heavy weather selection. And she has a surprisingly competitive rating. She’ll be able to keep going with her crew in relative comfort while smaller craft are bouncing around with crew fatigue becoming a major problem. AURELIA (Chris & Patanne Power Smith, RStGYC). The Power Smith’s J/122 is the Steady Eddy of the Dun Laoghaire fleet. She was the top-placed non-J/109 in last year’s Dun Laoghaire-Dingle in a race which might have been designed with the J/109 in mind, she has already won ISORA’s biggest race this year, and in all she is a boat which exudes competence. BAM! (Conor Fogerty, HYC) Athough the Sunfast 3600 Bam! won her class in the RORC Caribbean 600 in February, with her owner subsequently sailing her single-handed from the Caribbean to the Azores when homeward bound, she is not a boat which is suited to the restrictive Irish Sea courses. But the wide open spaces of the Atlantic with winds abaft the beam will enable her to fly – it’s just getting down to the Fastnet that will be the hard bit. CAVATINA (Ian Hickey, RCYC) The veteran Noray 38 Cavatina is the multiple Round Ireland winner most associated with Eric Lisson, but with her low rating and renowned staying power, if a flat patch happens to slow the whole fleet back, she’s always there, ready to pounce. While it seems unlikely this year, people have got Cavatina’s results prediction wrong before now. The Volvo Round Ireland Race 2016 with its record fleet has the task of prediction made more complicated by the many sub-divisions, one of the busiest being the Open 40 Class which is within IRC, yet also races on its own, and for good measure some of the boats are fully-crewed while others are in the Two-Handed Division. One of the most interesting of the latter is Roaring Forty 2, doing this race as Visit Brussels under the command of Belgian skipper Michael Kleinjans, who also happens to be the holder of the Round Ireland Single-Handed Record, which you can’t really compete for any more, as single-handed record sailing is now officially illegal in Irish waters. But it may well be that Kleinjans and his crew Ian Wittevrongel will set a two-handed Round Ireland Record in this race which will be worthy of future attention. Meanwhile, we’ll be carrying regular updates and comment on Afloat,ie HERE as the race progresses, based on the Race Tracker. We very much hope that by the time the time the prize-giving comes round in Wicklow on Friday evening, we’ll have mentioned every boat in the fleet at least once. But now, after partying on Thursday night (and a very good party it was too), there’s work to be done today, both off Wicklow and southward down the coast. And in the end, it will all be in honour of the memory of the great Denis Doyle and his crew for their beautiful 1984 win and course record. Denis Doyle and his crew aboard Moonduster after their great win in 1984. This photo was taken through glass in Wicklow SC, where it is on display in the Round Ireland Room. Has anyone any idea where the original neg might be sourced? There’s a problem with the Round Ireland sailing record if you’re hoping to set a new one in the Volvo Round Ireland Race when it starts from Wicklow at 1300hrs this Saturday, June 18th writes W M Nixon. The problem is set by that very specific date and that time. It in turn has been set for a long time now, two years and more. But the absolute unlimited round Ireland has become refined to such an extent that you have to allow flexibility and a very broad window of time in which to make your start, and within that arc of time you wait for conditions to come just right. Yet even then, as all your ducks of wind and weather come into the required neat row, it could well be that a few minutes either way in actually getting the record challenge on track may ultimately make a difference. It has become as sophisticated as that. However, when it’s a matter of the gun firing and the race going off at a pre-ordained time, while it’s the same for everyone, equally the possibility of a new record – other than for the race itself – is very much in the lap of the Gods. Yet it was the 704-mile Round Ireland Race which first began serious interest in an open record time. After Denis Doyle with the great Moonduster – a Frers 51 – set an astonishing time of 3 days 16hrs 15mins and 43 seconds in the race of 1984, it became open season for an open record. People inevitably speculated what might be done, going for it exactly when you wanted when wind expectations were optimised, and going with a multi-hull too. But if anything, the times initially recorded served only to emphasise what an astonishing achievement The Doyler with The Duster had made in 1984. Yet within a decade, a new plateau had been reached when Steve Fossett, with the 60–ft trimaran Lakota, enticed to Ireland by Con Murphy and Cathy MacAleavey who crewed with him, rocketed round in 1 day 20 hours 42 minutes and 20 seconds in September 1993. That open record stood for 22 years – it was only finally bested by Sidney Gavignet with the MOD 70 Musandam-Oman Sail in May 2015 with a time of 1 day 16 hours 51 minutes and 57 seconds. The fact that the MOD 70’s crew didn’t come anywhere near knocking the ten hours they’d expected off the Lakota record tells us what a fantastic performance it had been in the first place, but equally it means that it’s unlikely that anyone will be trying to better Musandam’s time any time soon, unless the wind and weather chips fall exactly the right way during a Volvo Round Ireland Race. But with Saturday currently forecast to see light nor’easterlies giving way to fresher sou’westers, while conditions aren’t entirely unfavourable, they could be much better. Everyone will have to take it as it comes, knowing that for a speedy round Ireland you need either nor’westers or sou’easters, not too much, not too little, and holding up well. It’s a big ask. However, we’ve plenty of other stats to be going along with, as the Volvo Round Ireland Race will almost certainly see a Race Course Record for multi-hulls established, for although a little cruising catamaran went off with the original pre-RORC fleet from Wicklow in the first race of 1980, nobody seems too sure that she even finished, and if she did, she certainly wasn’t first. But as the race developed its own mythology over the year, its own record elapsed times became interesting. That said, it took a long time to do better than Moonduster, but Lawrie Smith finally managed it in 1990 with the 83–ft Maxi Rothmans, shaving the Doyler’s time downwards by just three hours to set a time of 3d 12h 56m 06seconds. Interestingly enough, Gordon Maguire was aboard Rothmans when she set that time in 1990, and he was aboard Mike Slade’s 100ft Leopard when she set what is still the current course record of 2d 17h 48m 47s. But there was another course record in between those two times, in 1998 when Colm Barrington raced round Ireland with the Whitbread 60 Jeep Cherokee, and did it in a time of 3 days 4 hours 23 minutes and 53 seconds. When we remember that the Barrington time with a 60-footer was sandwiched between the times of an 83-footer and a 100-footer, it gives the Jeep Cherokee record an added lustre. But this Saturday, the MOD 70s and the likes of Rambler 88 will know that they have to be looking at a time of less than 2 days and 17 hours if they’re going to be making any sort of a dent in Leopard’s record. And for those looking for fresh records to conquer, you can forget about the single-handed record of 4 days 1 hour and 52 minutes established by Michel Kleinjans of Belgium in the Open 40 Roaring Forty in October 2005, for if you tried to do the same, you’d probably get arrested, as ambitious single-handed sailing is officially frowned upon in Irish waters. But there is a growing area of interest, the two-handed record, so we’ll watch what this year’s race serves up in that department. However, as for the open mono-hull record independent of the race, here again we have the same kind of time, in its way, as was set in 1993 by Lakota. It was in 2006 that the fully-crewed Open 60 Cityjet/Solene (Jean-Philippe Chomette) went round in 2 days 9 hours and 41 minutes, and even the mighty Leopard in 2008 took eight hours longer than that. CityJet/Solene had ace meteorologist Chris Tibbs calling the strategic and tactical shots, and he got it so right that it has an unbeatable look about it, but then they used to say the same about the Lakota figure. Be that as it may, here’s a shortened tabulation of sorts, and it all starts from Moonduster’s performance of 1984, the Great Mother of All Round Ireland records. 1984 Moonduster (D. Doyle, RCYC) 3d 16hrs 15mins 43s. Damian Foxall and Oman Sail’s crew on the Sultanate of Oman’s giant trimaran Musandam-Oman Sail are determined to fly the flag for Oman (and Foxall's home county Kerry) in Wicklow Sailing Club's Volvo Round Ireland Yacht Race this Saturday by beating the two other Multi70s and defending their Round Ireland world record. When the race starts in Wicklow on Saturday, Sidney Gavignet’s team will have their sights on defeating Phaedo 3 and Concise 10, the two other 70–foot trimarans competing for honours. Lloyd Thornburg's Phaedo3 has on board some Irish talent too. Double Volvo Ocean Race winner Justin Slattery is on board. Also on Phaedo3 is the UK's Brian Thompson, one of the most famous sailors in the world. He was the first Briton to break the Round the World sailing record twice. He was also the first to sail non stop around the world 4 times. Despite a win over Team Concise in the recent Myth of Malham Race, they will have to pull out all the stops to achieve their aim, according to Gavignet, but after some intensive preparations, they were savoring the opportunity to compete. “We see this as the most important race of our season,” said skipper Gavignet who will share helming duties with Omani Fahad Al Hasni and Irish offshore heavyweight Foxall over the two to three-day challenge. “We do not know how we will get on against the other two but we really want to finish ahead of them both! They have done a lot of sailing this year and from the Myth of Malham, I’d say that Team Concise are sharp and we understand that Phaedo has had a complete refit with new 3D sails. “But we know from when we set a new Round Ireland world record last year that this is a difficult course. The 704nm race clockwise round the Emerald Isle, as it is known, is a mix of coastal and offshore challenges so French navigator Jean Luc Nelias will have his work cut out while everyone is prepared for heavy weather along the way. “Ideally it will not be too bad on the west coast - we do not want to be hammered by a massive low,” said Al Hasni. Gavignet will leave it until Friday when the team assembles in Wicklow for final training to announce his six strong crew for the race but his options will include debutant Raad Al Hadi, the 95kg powerhouse known as ‘Thunder’, after he participates in delivering Musandam-Oman Sail from Lorient to Wicklow. Also available are Yasser Al Rahbi and Sami Al Shukaili who were on board for the record-breaking voyage in 2015 when Musandam-Oman Sail smashed the Round Ireland record completing the course in 40 hours, 51 minutes and 57 seconds, slicing four hours off a record that had stood for 22 years. All have been in France competing in the J80 class at Normandy Race Week which has helped with refining boat handling skills and building on a strong team spirit in preparation for the Round Ireland Race and also for the 2016 Transat Quebec-St Malo race across the Atlantic in July. Some of the world's top offshore sailors in some of the world's top racing machines from both monohull and multihull disciplines are heading for the Irish east coast this week in advance of Saturday's Volvo Round Ireland Race off Wicklow. Over half of the fleet are gathering in Dun Laoghaire harbour this week to avail of Wicklow Sailing Club's new tie–in with the Royal Irish Yacht Club and the facitlities of the town marina. 33 boats will prepare for the 700–mile cricumavigation at Dun Laoghaire but not even Ireland's biggest deep–water marina can host the biggest yacht in the fleet. The world's fastest monohull, the supermaxi Rambler 88, will use a mooring in the outer harbour for reasons of depth. The George David skippered super–yacht is expected to be the star of the 2016–fleet. Wicklow Sailing Club will host an eve–of–race fleet recepton at the Royal Irish Yacht fleet reception on Thursday when it is understood most of the fleet will be in–harbour. Some yachts have already arrived. The world record breaking Phaedo 3 trimaran, skippered by Lloyd Thornburg, has already been spotted out on training runs on Dublin Bay last Saturday. Also in port is the oldest boat in the fleet, the 1936 Maybird skippered gaff–ketch that will race in class five. Katsu, a Reichel-Pugh design, has been entered in class one by Alan Hannon of the RORC and she is alongside at the RIYC. One of two Concise Class 40 Class 40 yachts are on the marina along with the Phaedo3 tri. Half of Wicklow Sailing Club's 65-boat Round Ireland fleet will be in Dun Laoghaire harbour by Thursday for the pre–race reception at the RIYC clubhouse. Royal St George Dragons "Phantom" & 'Jaguar Sailing Team' shared equal points well ahead at the top of the leader board at this weekend's Dragon East Coast Championships hosted by the Royal Irish Yacht Club. Phantom helmed by Neil Hegarty took the overall title by virtue of their accumulation of three first place finishes. Martin Byrne & Adam Winkelmann's Jaguar scored all their results in the top three to finish second overall. Richard Goodbody on "Diva" from the RIYC won the final race to take 3rd overall. Six races will be sailed in the waters of Dublin Bay for the Irish East Coast Dragon Championships in just over a fortnight. Last year, Andrew Craig's Chimaera topped a 13–boat Dragon fleet to win the East Coast Championships at the Royal St. George Yacht Club at the weekend. Second on the Dublin Bay race track was Craig's club mate Phantom skippered by Neil Hegarty with Kinsale Yacht Club's Little Fella Cameron Good third overall. The Royal Irish Yacht Club hosts the 2016 event that runs from Friday 27th to Sunday 29th May 2016 and will be sailed over Windward-Leeward courses. The NOR for the three man keelboat is available to download below.